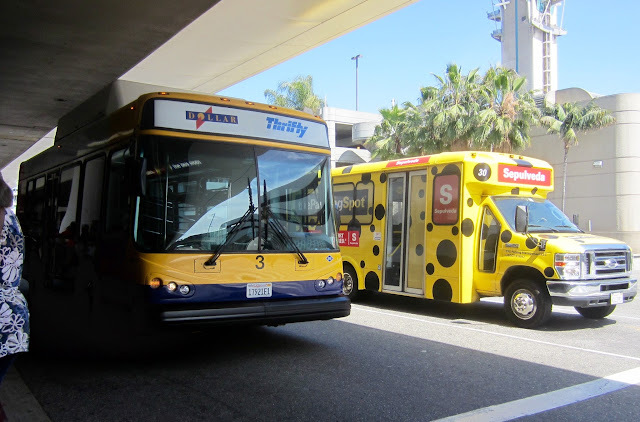 As you will already have read on previous posts, the summer 3 service is now under way until September. Currently running at an hourly rate with two vehicles required. I had seen that recently refurbished ALX400 32058 was in use today so decided to brave the weather and grab some shots of her at the Seashore terminus. 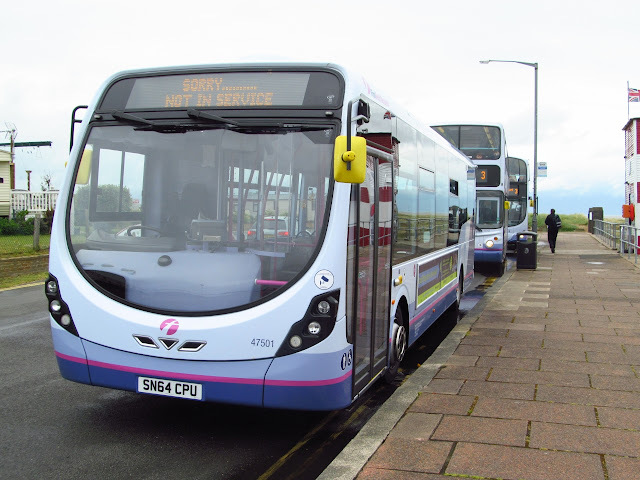 I was greeted with the sight of Streetlite 47501 which was parked awaiting a driver change and then before you know it the famous saying came true, "You wait for one then three arrive at once". 32058 appeared heading for Hemsby with Gemini 37576 arriving bound for the Seafront and Vauxhall Holiday Park. Nothing in the way of a planned day out but it began at Caister Road where another ex Yarmouth vehicle had found its way back to the coast. 20515 had been working rail replacements between Yarmouth & Norwich on Friday and was parked up in front of the depot yesterday. 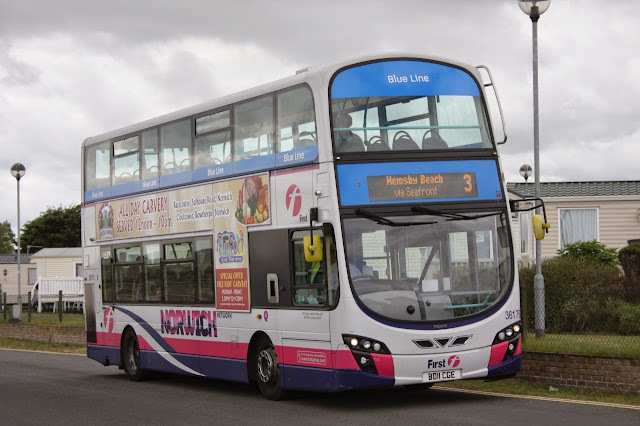 I then ventured into town for some shopping, nothing of note to report here on the bus front, new arrival 32202 was noted on the 1's with 32211 on the 8's. Excel liveried 37573 had again found its way onto Bernard Matthews duties at lunchtime. Former Yarmouth Gemini 37562 was noted unusually on the 35 service, a photo of her will appear on my Flickr site. Nothing else of note to report apart from a very nice pint of Norfolk Nog was had in the Bell Hotel prior to my return to Yarmouth! Ambassador 252 ex FJ08FYA now registered KIG8458. 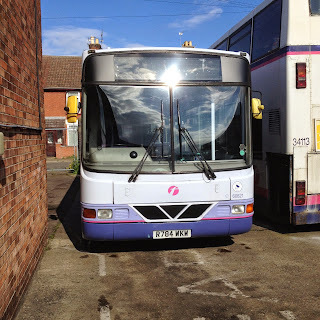 Final stop on my journey was Ambassador's yard on Gapton Hall, another re-reg to report is Volvo B12B FJ08FYA has now gained cherished registration KIG8458 along with quite a few others recently on the fleet, FJ08FYB was also noted still with original plates. 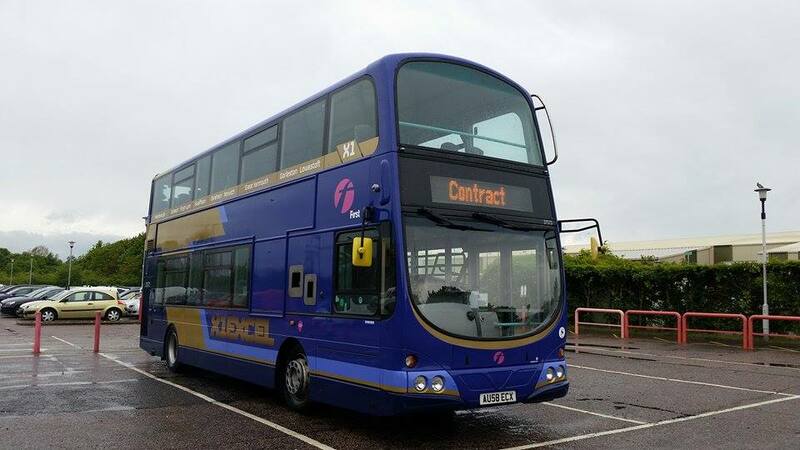 Unusual allocation for the lunchtime Bernard Matthews contract run today saw Excel liveried Gemini 37573 AU58ECX appear in use from Yarmouth Depot. 37573 awaiting its passengers at Bernard Matthews. Many Thanks to Roger Bellward for sending the photo. Grahame. Good to see the piece on the blog about LH 930 today. It was actually painted up as the 'Commuter Express' for a service which we started up in North Norfolk in the early eighties between Holt and Norwich. 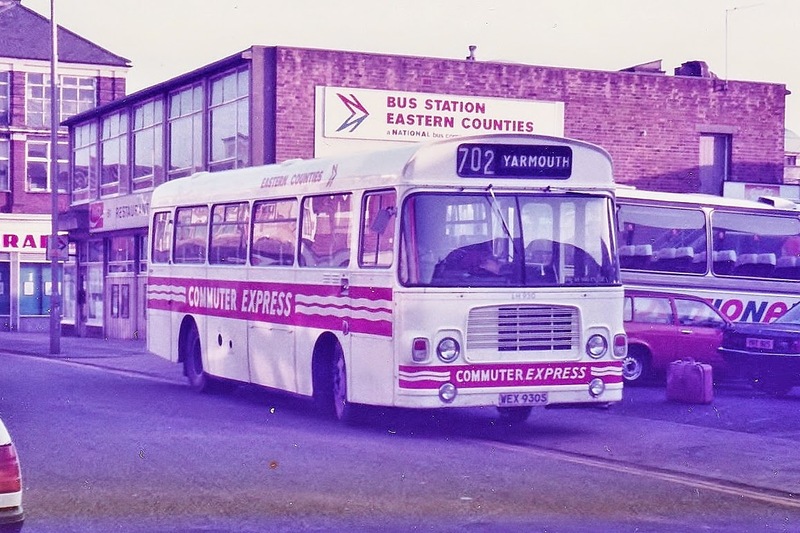 Fitted with coach type seats and giving out daily newspapers, it ran via the main road to Norwich once a day in each direction. 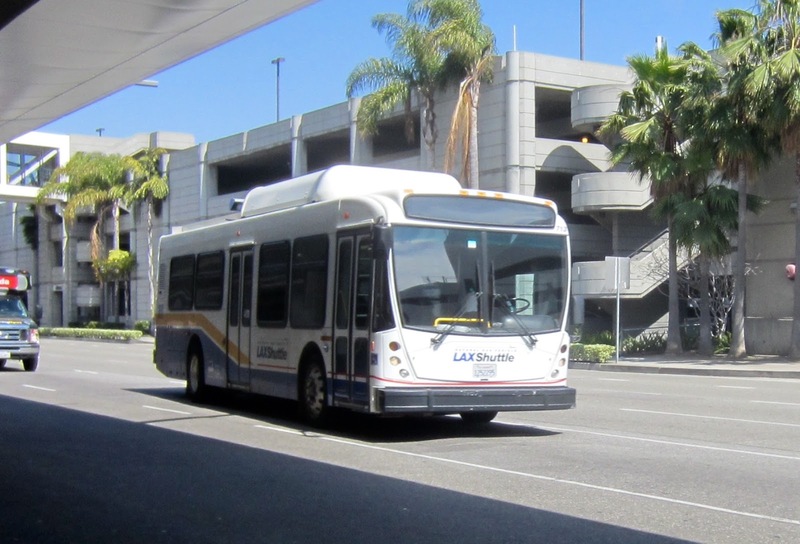 I frequently drove this service with the LH although other types also appeared from time to time. 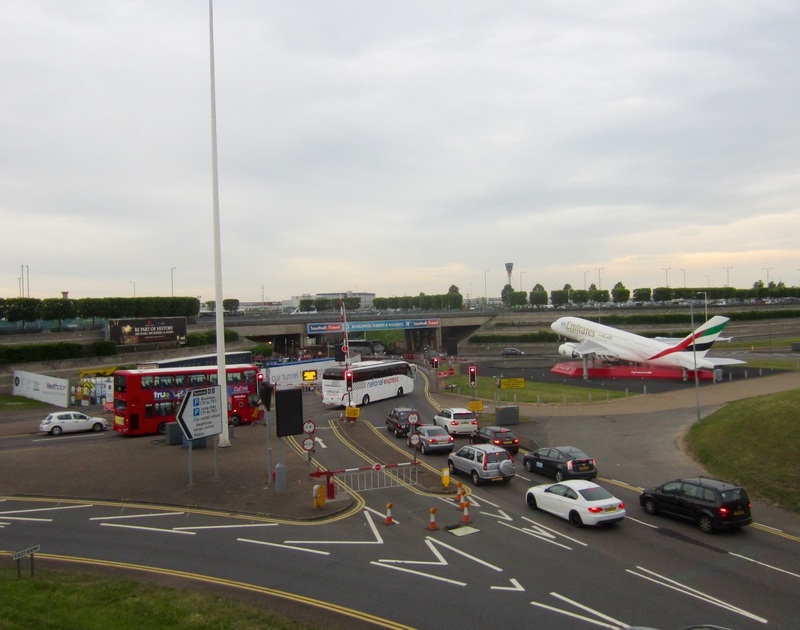 You could not find a worse road to put an LH on, and I think that it probably spent more time airborne than attached to the road surface!! 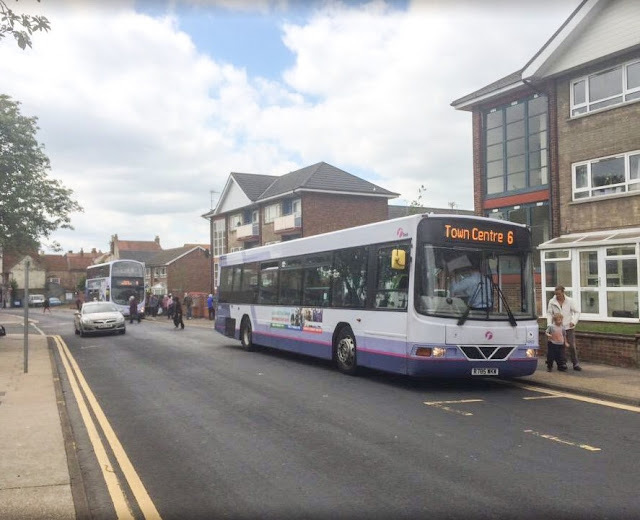 The service was worked by Cromer depot with the bus running dead to and from Holt each day. In later days, the LH spent much time on local routes around Cromer and North Walsham, and even managed some main road services as well before transfer away. 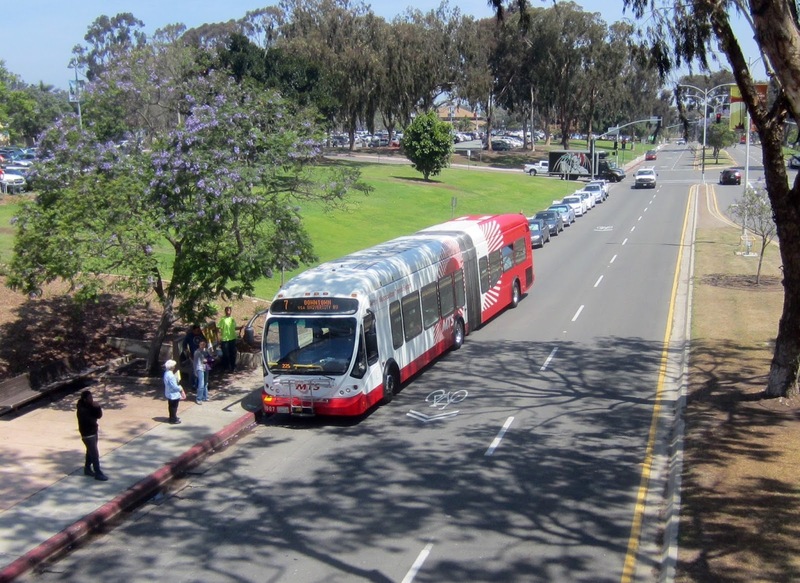 One of my favourite buses of the time. Latest News from Caister Road sees two former Yarmouth vehicles return in the shape of Volvo B7TL's 32202 & 32211 from Norwich. 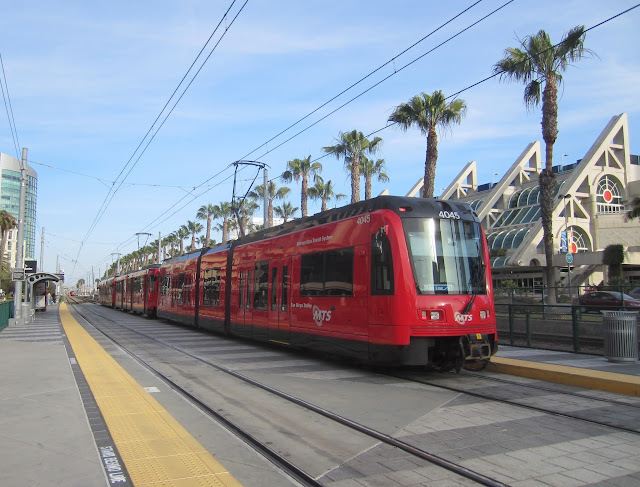 Both will be on loan here for the summer due to the increased PVR for the 3 service. 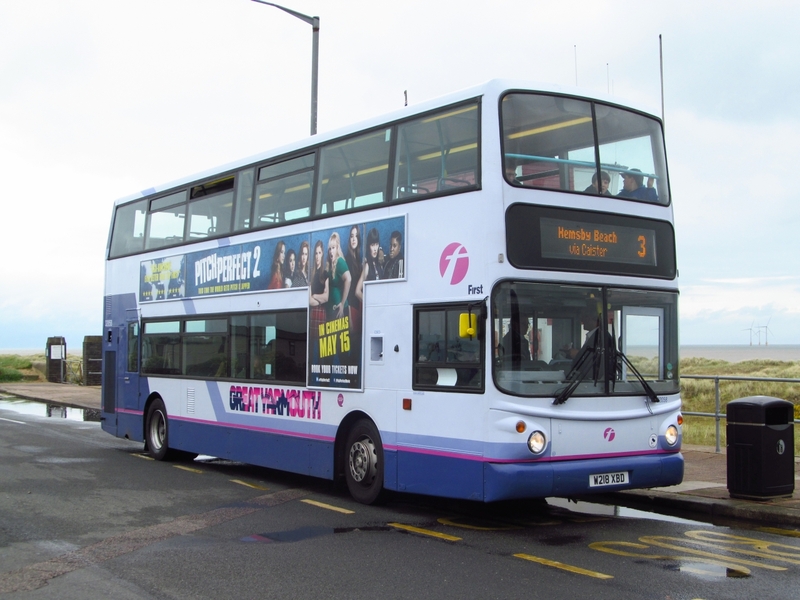 32211 working the 3 at Seashore back in July 2010. Other news sees Lowestoft's 30889 currently on loan here whilst Olympian 34109 is off the road with a gearbox problem also. Finally ex Leicester Gemini 32629 is a Volvo in Norwich having a new engine fitted. Thanks to Danny at First for the information. Grahame. We stayed overnight at the Park Inn Hotel close to Heathrow Airport and straight-away I observed National Express Enviro200 8343 SN08ADV providing a connecting shuttle between the hotel and the airport terminals. 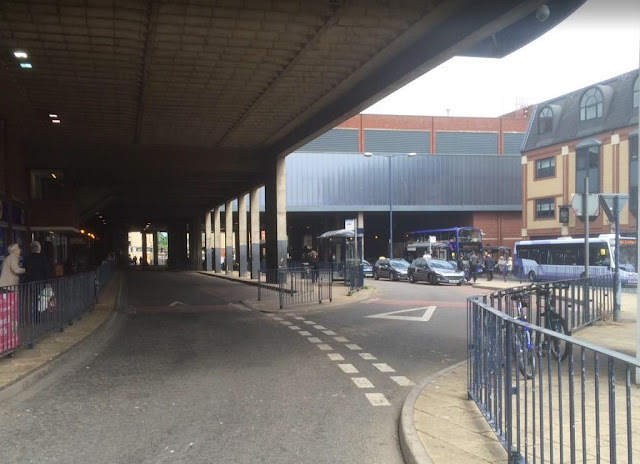 The western side of Market Gates Bus Station was closed earlier today due to subsidence in Regent Street. It is not known how long the temporary arrangements will remain in place. Although a period of five weeks has been rumoured! 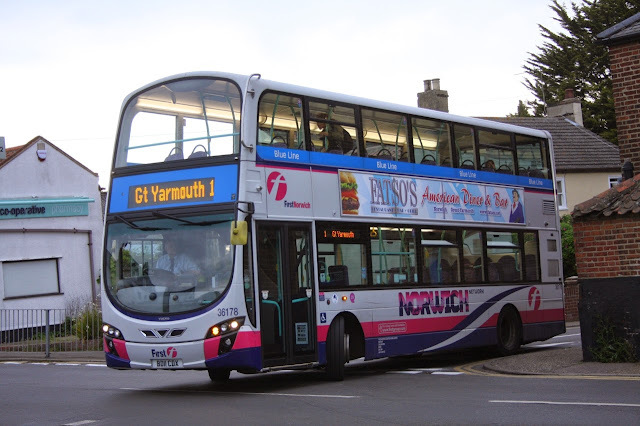 The usual Summer Service 3 began this weekend with an hourly service between Great Yarmouth and Hemsby. It will increase to half hourly at the beginning of the School summer holidays. 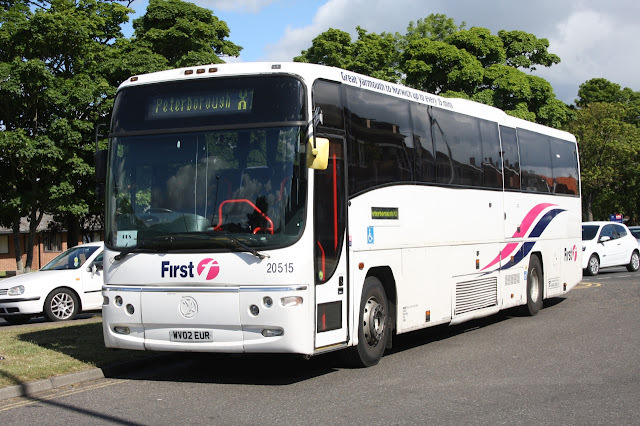 The current vehicle requirement for the route is 2 vehicles and Monday morning saw a couple of strangers working the route, neither from Yarmouth's own depot. 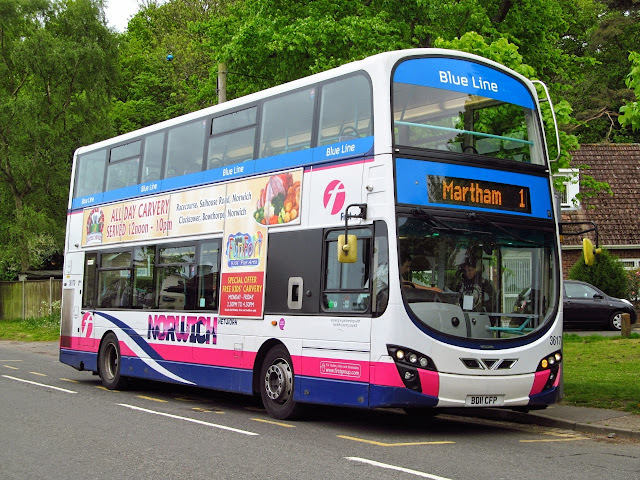 Norwich Gemini 36176 BD11CGE heads towards Seashore Camp en route to Hemsby. Away from the buses, I would just like to send our best wishes and thoughts to Yarmouth Driver Paul Chipperfield who was in involved in a serious car accident on Saturday evening. He is currently being treated in Norfolk & Norwich Hospital, I know Paul and I'm sure lots of others who read the blog will too. 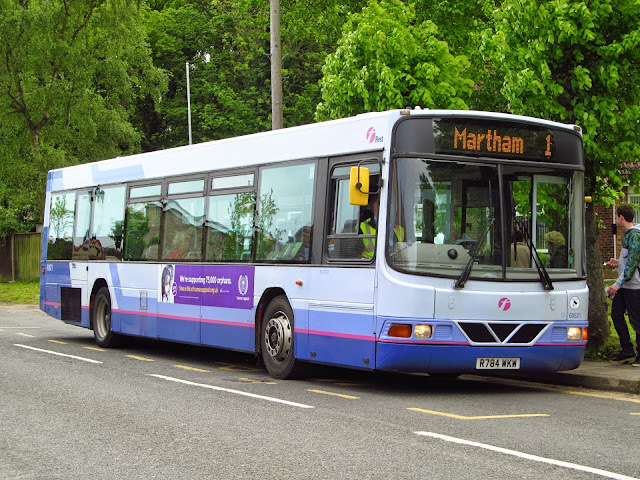 Latest loan arrival from Rotherham 60621 R784WKW is now in use here, i managed to grab some photos of her this morning working the 1 service to Martham. 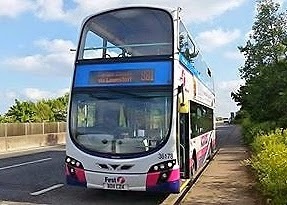 Prior to transfering to the the refurb unit at Rotherham it was in use with First Bradford. Radio 1's Big Weekend takes place this weekend in Norwich, with extra vehicles being required for Park & Ride and shuttle services First are drafting in extra vehicles from other depots to cover the services. 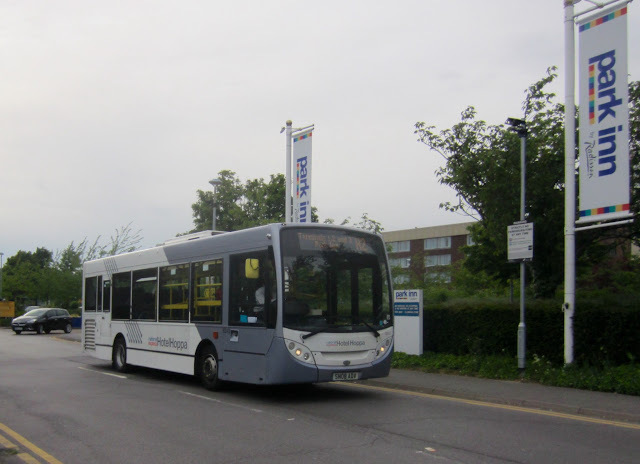 Yarmouth Volvo B9's 37574,37575 & 37576 have so far made the move city bound along with Lowestoft 37571. 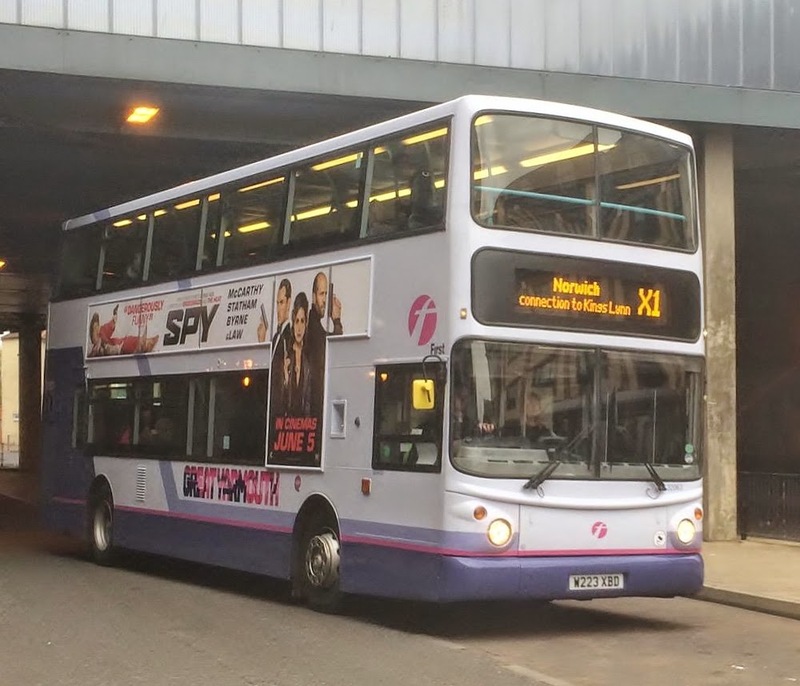 Ipswich are supplying ALX400's 32655/32656 and Heritage liveried 32479. On my way home this evening from Lowestoft on the A12 i noted Norwich Based Volvo B9's 36176 on the X1 and 36178 on the 1's heading to the suffolk town. 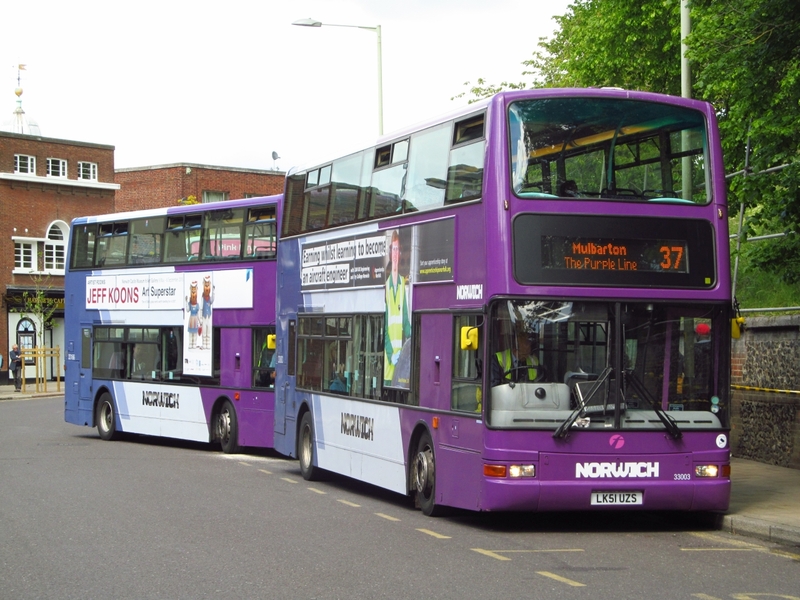 I can now confirm that Norwich vehicles 36170,36176,36178,36179,36180 and 66335 are on loan to Yarmouth. 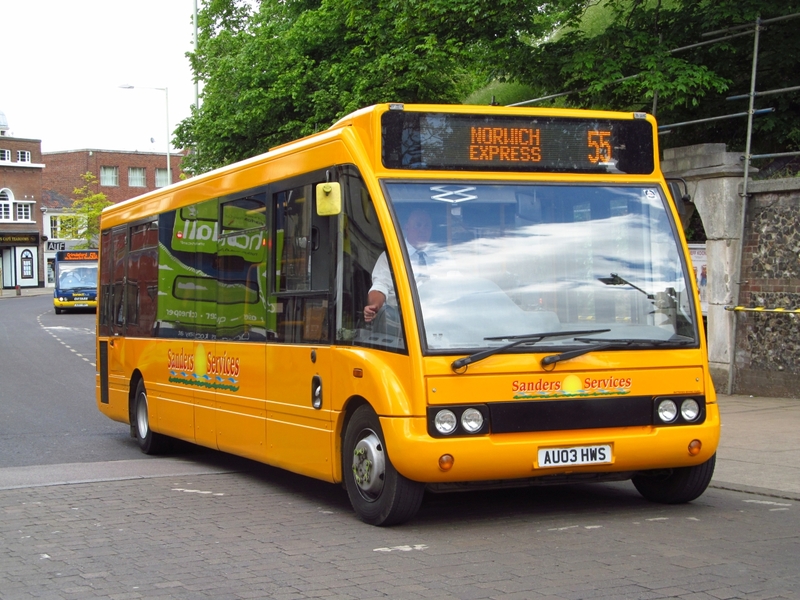 The reason for the changes is due to the fuel tank capacity on Yarmouth's own B9's being larger than the Norwich ones and they are also being used on Monday to take Norwich supporters to Wembley Stadium so the Norwich vehicles will remain at Yarmouth until Tuesday. It has now moved from its location to more secure premises at Great Yarmouth College and Ryan sends a photo of it at its new abode! 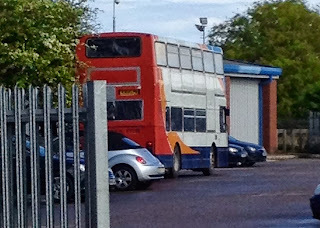 Grahame reported the vehicle as N368LPN (16368) an Alexander bodied Olympian which is ex Stagecoach Kent. 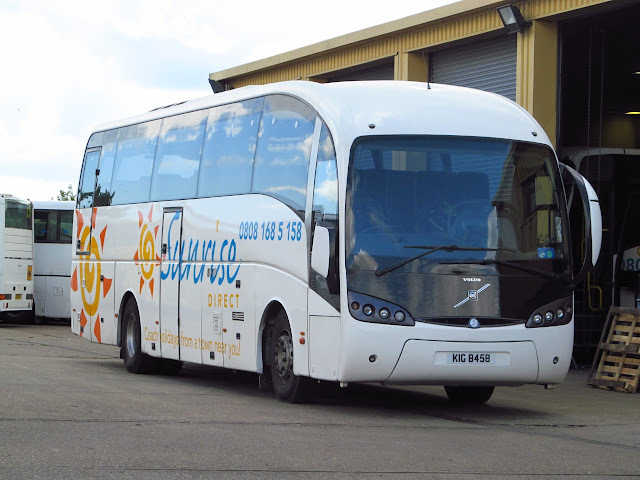 It has been purchased by a local charity and is to be converted for use a shelter/sos type vehicle for the charity. 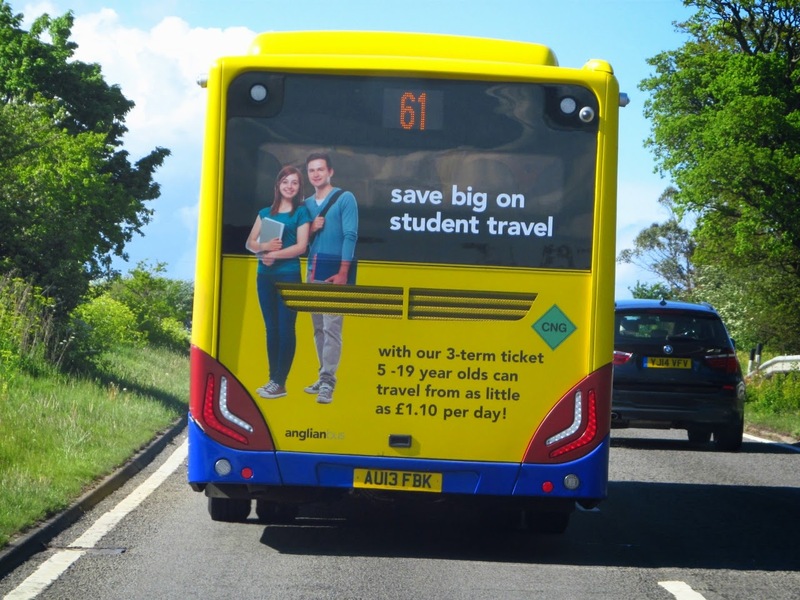 Anglian have begun promoting Student travel on the rears of some MAN Gas buses, a couple noted on the 61 service today in Lowestoft. 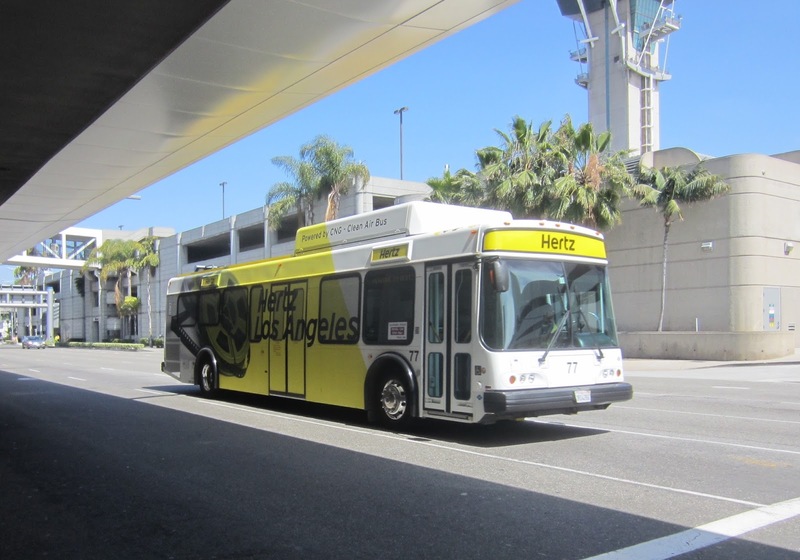 The design is similar to promotions carried by fellow Go Ahead company Konectbus. Also present was Patrick Burnside's immaculate Eastern Counties Omnibus Company KNG711, a 1950 Bristol L5G 35 seater saloon with ECW body and Gardner engine. 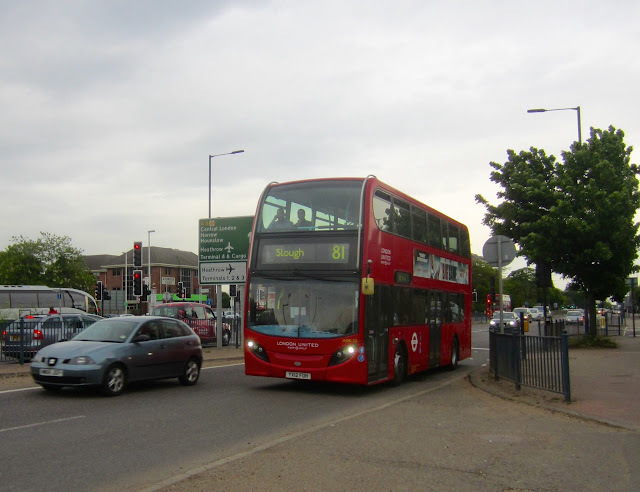 New to the company in July 1950, LL 711 was withdrawn in January 1968 and passed on to dealer Ben Jordan of Coltishall. 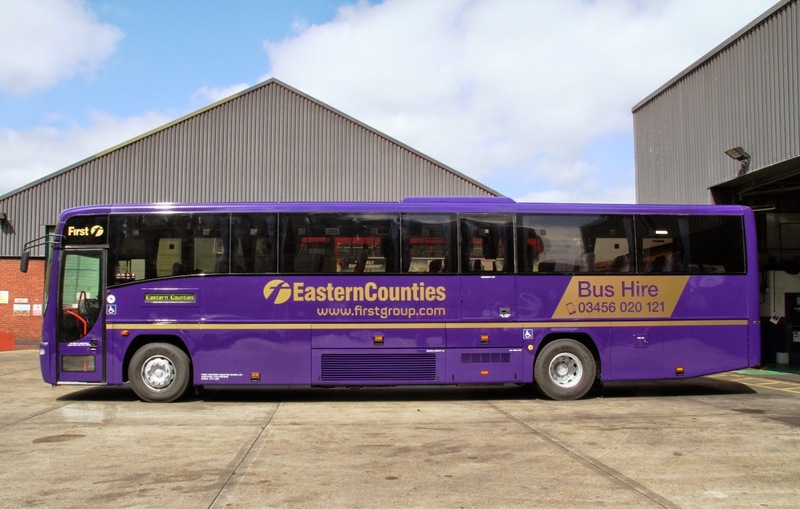 Its stay there was short lived quickly being sold to Simplex of Sawston, Cambridgeshire for use as a workers bus in all over green. 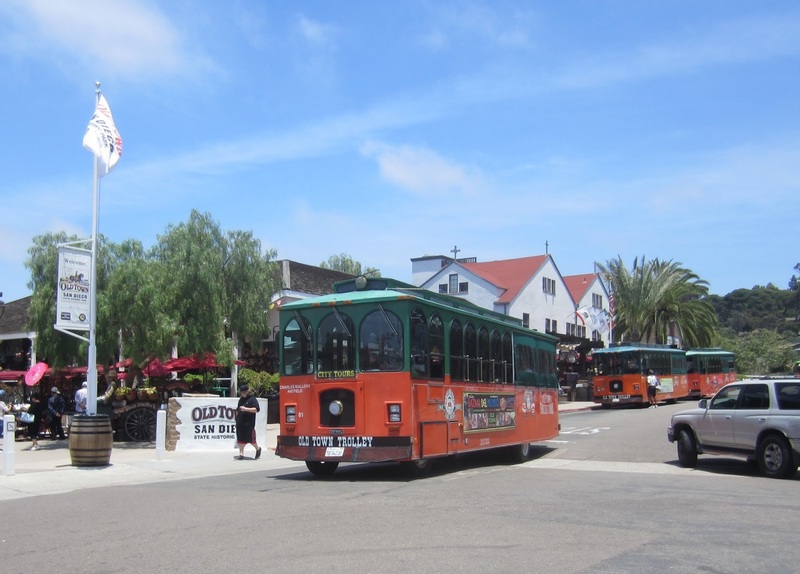 On withdrawal and ownership by two preservationists, LL711 was bought by Patrick who has fully restored the bus to its original 1950s condition. 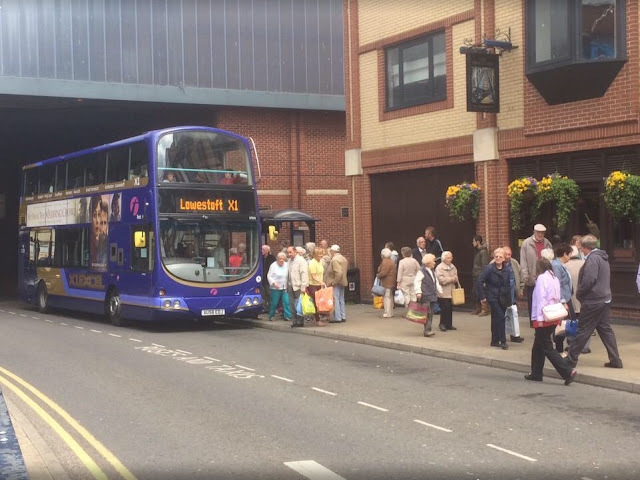 Norwich City Centre was quieter yesterday than a normal Saturday - had it got something to do with a certain football match I ask? So, with Norwich making the final of the Championship play-offs will they grab the last place available to play in the Premiership next season? 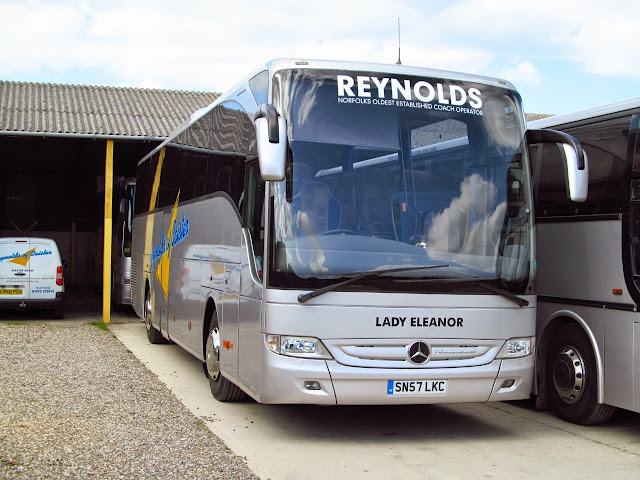 A new arrival to report here is Mercedes Tourismo SN57LKC, it has gained full Reynolds livery and has been named Lady Eleanor. It was new to Allan of Gorebridge as B13DWA before being re-registered in March 2010, she last operated for Boultons of Cardington in Shropshire before heading to Norfolk. 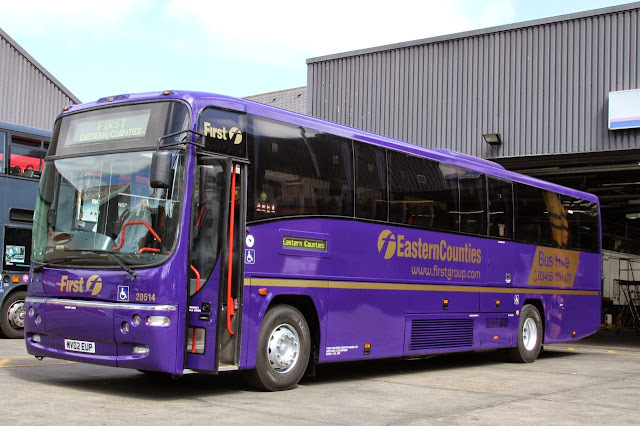 Courtesy of Jim Long we can bring you some of the first photographs of newly refurbished First Coach 20514 which has been repainted into a new Purple livery with Gold Lettering for Firstgroup's Private Hire Fleet in the area. 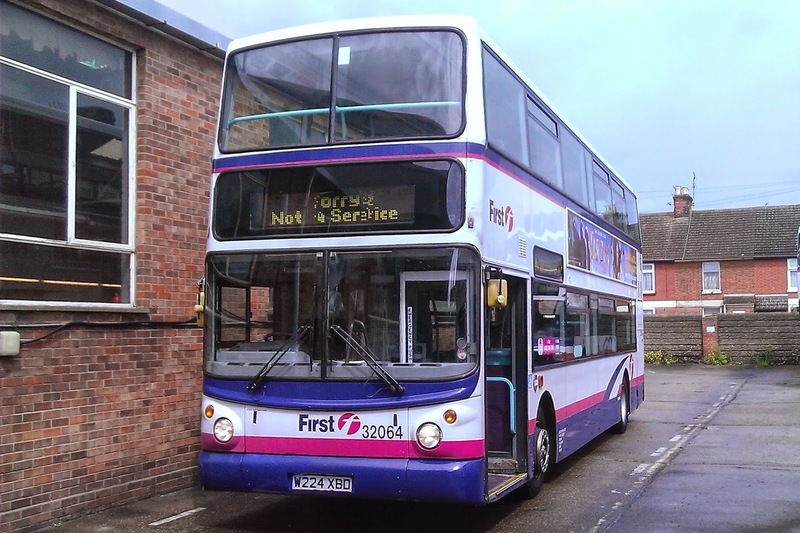 The vehicle was repainted by local company Simon Morris in the town. 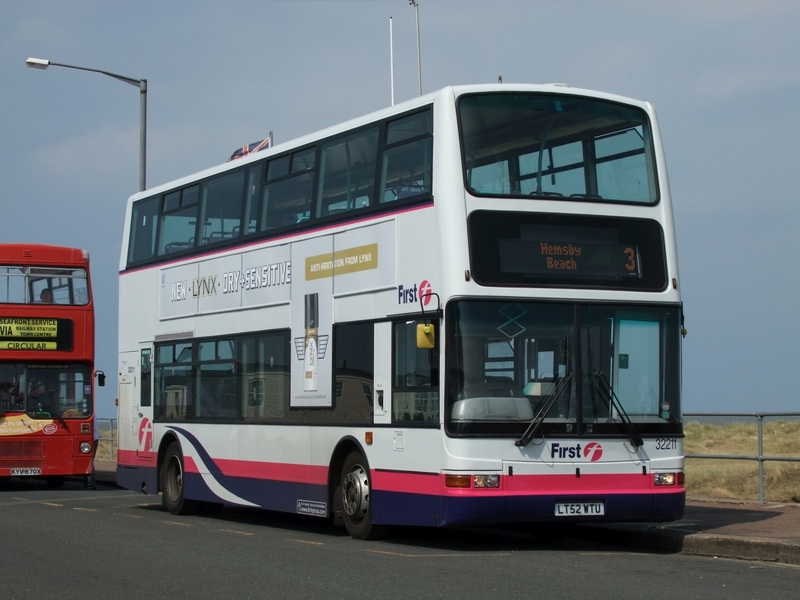 Sister 20515 is also due to gain the new colours, A far cry from their look when they first arrived at Great Yarmouth for X1 shuttle duties a couple of years ago. Many Thanks to Jim for the photos as always. Grahame. There will also be many trade stands on site as well as the BBQ. 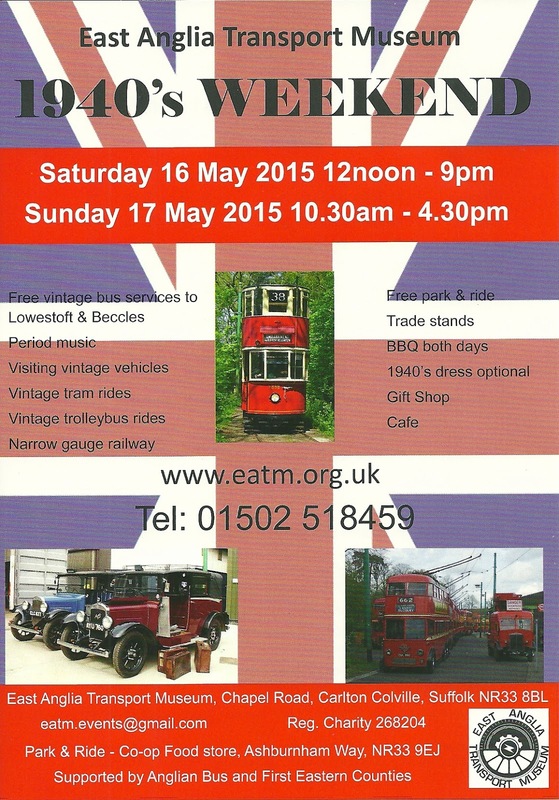 The proceedings begin at midday on Saturday with after dark running until 9:00pm. Sunday opening times are 10:30am to 4:30pm. 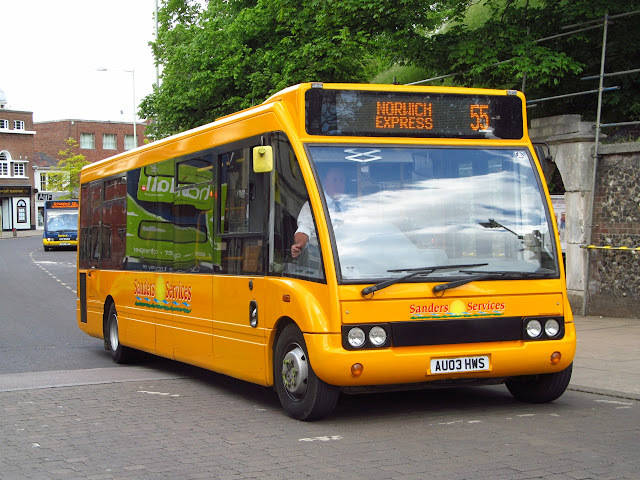 Also minor timetable changes on early Saturday mornings to improve connections with X1 to Norwich at Great Yarmouth, Market Gates. 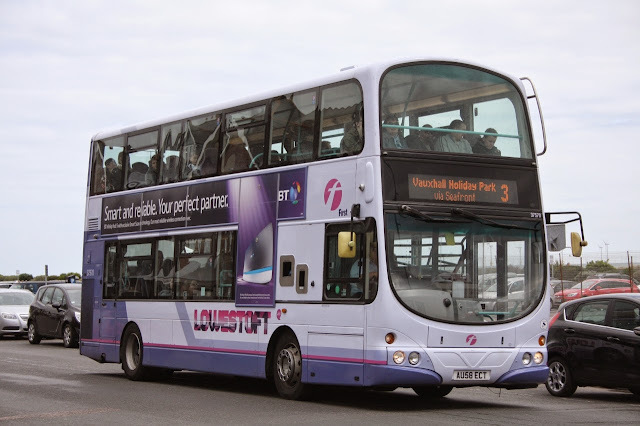 Minor timetable changes to co-ordinate services between Lowestoft and Pakefield.